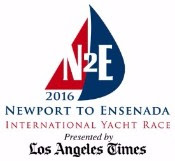 ENSENADA, Mexico, April 22, 2016 – Orion, the MOD70 based in the San Francisco Bay area and owned by Tom Siebel, broke the fastest elapsed time record in the Newport to Ensenada International Yacht Race. Orion crossed the finish line with an incredible time of 5:17:26. This demolishes the old record of 6:46:40, set by the late Steve Fossett on the yacht Stars and Stripes in 1998 by more than 1 hour and 29 minutes. Earlier in the day, Orion crossed the start line ahead of its two classmates. Apparently, it never looked back. Winds at the start were a modest 8 to 9 knots. But all classes caught steady gusts and were horizon bound by 12:30 p.m. Mighty Merloe, the 60 ORMA that has been dueling with Orion for first to finish honors the past three years, followed just 20 minutes later with a time of 5:37:18 – also breaking the old record by more than an hour. Orion is also expected to win its class based on a corrected time of 12:26:36. The Orion crew had turned the boat around and was heading north before many of the race organizers were able to arrive from Newport Beach. A series of accidents and heavy traffic on the I-5 freeway and at the border crossing meant many of the hardworking race hosts missed seeing the historic finish. But unlike the year when Dennis Conner set a record, the finish boat was in place to record the record time. Some of the shore-side sailors estimated the breaking run meant Orion averaged 25 knots an hour over the 125-mile course.